My abs hurt a bit. My lack of fitness discipline made me forgot I had any. Just a few days ago I made the commitment with myself to go back to the fitness studio (it is different from a gym). I work out at a fitness studio that belongs to is a client and friend of mine. In 2014 I cut back on running and working out. This was a bad decision which reflects quickly in my face as I’ve gained weight. I have always struggled with controlling my weight. Like most people, I get into a routine and when I fall off track, it’s difficult for me to get back on board. I stopped going to the gym a few times in 2014 and that kept me away for most of the year. I also did now write as much as I wanted to write. I focused on my goal of reading 52 books in one year but also missed the mark with that goal. To be honest I rather create than consume. I rather be active than passive. Although reading is important, keeping a balance is critical. I returned to the gym to seek a healthy routine and get back on track. I think of how many like me have different flavors of discipline. When it comes to business I am always able to meet my goals and deadlines. My friends Jeff Pulver and Chris Brogan have been doing a great job at being disciplined in business and fitness. It’s inspiring to see such successful entrepreneurs doing their best. We are all humans and we need motivation and guidance. I am also driven by not hurting anyone economically. For that reason I am very disciplined when it comes to business matters. A sales person establishes a routine to keep their sales pipeline healthy. If you’re a baker you probably wake up earlier than everyone else. You provide warm and fresh bread when your customers crave and want it. If you run a food truck like Uncle Gussy’s, you establish a routine to prep your food. On some occasions, that prep takes place days before you serve it to customers. Nicko consistently provides excellent customer service to each customer approaching the food truck. Nicko offers the same smile and care to the first customer early in the morning and to the last customer in the afternoon. The customer probably doesn’t notice that he has been going non-stop from anywhere to 14 hours at a time. My friend Andres owns the personal training studio that receives me with open arms when I return from my training hiatus. He is also an example of on-going discipline to keep his business running. He wakes up at 3:00 a.m. to start taking care and training clients that want to work out early and continues training other clients that rather work in the late evening hours. Andres guides his clients into better health and appearance. But like every other business, creating the right environment to inspire, is one that can be exhausting. I do the same for my clients when it comes to the health and appearance of their business. I look for ways to create processes and routines that will make people and their businesses successful. I guess we all have to play to our strengths. We seek motivation in what we are good at, so we can support our week areas. So what are your strengths? Are you good at working out? Are you a great salesperson? Now find one thing you do right and try to use that method to improve one or two weaknesses. Take your discipline flavors and mix them and see how they can make you stronger. Life evolves and I find myself going to less events and holiday parties throughout the years. But when I do decide to assist a party or event it has to be a meaningful one. (that sort of sounds like the Dos X man of Mystery). 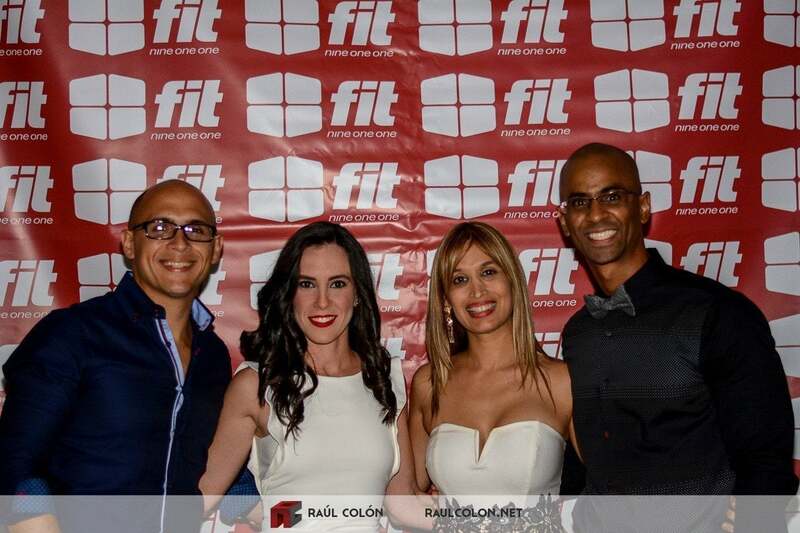 So yesterday my good friend Andres Vasquez Invites me to his Fit911 studio Christmas Party. It seems the party ran into the early hours of the morning I left shortly after 1am. It was the first Christmas Party of the Season and knowing me probably my only one. Andres has been a long time friend and also someone who I have been able to collaborate with over the years. The guidance on my weight loss and maintaining it has come from him. Even when I don’t visit the gym in months just following his advice leaves me in a better place. In the next week or so I will be returning to train and do exercise. I stopped shortly before September and have not gone back. Andres created an unforgettable experience for his community and clients last night. With the help of sponsors and the awesome Steven Mcqueeny at his Bytes restaurant. If you are in San Juan you will definitely want to stop by his restaurant and try his drink and food experiments using Nitrogen. I had a blast I had the chance to capture some cool pictures you can browse through below. I am proud of the results of the effort Andres and his wife Arlene have put through with this project. Being a small business owner in Puerto Rico is extremely challenging. Seeing a business like Fit911 thrive against obstacles is inspiring. It gives me and others motivation to continue fighting. Thank you for the invite it was special since it was the first awesome Christmas party invite I received in a while. Feel free to contact me for any prints or digital copies of these photos with or without the watermark (for sale). Every day we are bombarded with shortcuts you can take to lose weight, gain muscle, get abs, and look skinnier. The list of scams is infinite and we keep spending our money when the answer is getting active and striving to live a better lifestyle. I have always attempted to live a healthier lifestyle. One of my first attempts was when I was 17 years old and I visited the local GNC for the first time to buy a body building supplement named Cybergenics. I remember it had a very strict diet that I followed for months. This was a real challenge while living in my parent’s house where both are awesome cooks and normally prepared very unhealthy but delicious food options. My dad and mom supported me and prepared my meals on the side so I could follow my diet but they were not as tasty as dad’s usual culinary creations. In 2006 I became vegetarian and in 2011 I made a stricter commitment by becoming vegan (meaning I don’t consume any animal products). I was eating a lot healthier than many other people but I was slacking on the exercise part. I was running but lacked the knowledge on how to get my body to slim down, add muscle, and feel better. I realized that I needed to work with a personal trainer again. That is when I decided to start working with Andres Vasquez a local celebrity personal trainer at his new fitness studio Fit911. After many years of Andres working as a personal trainer at other gyms, he set up his own shop and at his own place where he could create a unique customer experience. Ten months later, I have to say I have changed my appearance, changed our family’s eating habits by consuming less fattening vegan options, made some really cool friends, and even landed a sweet business deal. My personal trainer Andres is not only an expert at fitness, he knows how to connect many dots to make sure you reach your goals. From changing someone’s behaviors, to helping them understand why nutrition is important, he keeps them motivated throughout the program. Andres also has a unique personality where his humor and energy make it easy for others to want to come back again for more (even when it can seem extremely challenging). When people start feeling and seeing the results like I have in the past few months, it really makes you grateful to have such an experienced fitness coach and trainer on your side. Personally, I really enjoy the results and the opportunity to work with Andres. He helped transform my body into a healthier and lighter version; hopefully I helped him with improving his online presence by doing a website re-design and coaching him on how to tell his story online and offline. Andres has many more projects to come some of them family oriented to fitness. I can’t wait to see how they take off and I want to be a part of it. As you see in the picture and video below, my 2 ½ year old toddler goes with me to the gym where even she burns some energy. In the meantime, you can stay up to date on fitness tips and success stories by subscribing to his newsletter and blog via email. PS: Andres is celebrating his Birthday weekend today so feel free to tweet him a birthday wish or leave a message on Fit911 Studio’s Facebook Like Page. For some reason when we leave the gym it is so difficult to go back. I guess thinking of what we have to sacrifice to get back to where we left off can only make it harder on us. The reality is there are no shortcuts when it comes to fitness. Your best bet is to focus on where you want to be not where you have been. I have not trained in a Gym since before Daniela was born. I lost my biggest client at about this time two years ago and then I ended up not having a reason to be near the gym (which is 1 hour and 15 minutes away from what was my home). Why not go to another gym closer to home? I became loyal to my personal trainer and the great results I use to get training with him. I could not bring myself to finding someone who came close to his training techniques in the south part of the Island. Instead of seeking other alternatives I took the easy route and I completely gave up on the gym. Thanks to a recommendation by my friend Melvin, I went to Dynamic Martial Arts and Fitness Center in Isla Verde and the owner Mike Oreza was nice enough to offer me a one-week free trial. I am sure there are many other gyms close by but I will definitely consider a recommendation from a brilliant friend and trustworthy guy like Melvin. Making such a tough decision to go back to a gym and pay for a membership is not an easy sell for any Gym management or owner. Having satisfied customers like Melvin makes Dynamic Martial Arts and Fitness Center a place where they have the opportunity to scale business by having their customers spread the word and market their services via word of mouth. Keeping a gym running is no easy task. Keeping a gym’s members happy is even more complicated. However Dynamic seems to be a place where I will end up being happy and it has many other benefits to it. Just the fact that Mike Oreza reached out and gave me a trial week shows he has a very different attitude than other gym owners in the area. As I prepared to go train for the first time in a gym, I can only think of what other things Gym owners or subscription based businesses have to do to bring clients and more importantly keep those clients coming back. After using the one-week free trial I have to say I was very happy with the service, how clean the gym was, and I was able to train without too many people. Thanks again to Dynamic Martial Arts and Fitness Center for giving me a one-week free trial. So if you are staying in Isla Verde, Puerto Rico and need a gym to go train, do Yoga, and a variety of Martial Arts, feel free to visit their website. Disclosure: I received a Complimentary One-Week trial which they offer to guests of the gym. Even though the one week free trial was an invitation by the Dynamic Martial Arts we don’t feel that this influenced the writing of this post in any way. As a kid I use to participate in Indian runs when we had physical education, in the military they used to call them Fartlek runs. Fartlek that according to Wikipedia means “speed play” in Swedish, consists of running a certain distance at a higher speed and slowing down your pace or walking for a few minutes in intervals. Around March I stopped running my usual 6-7 miles a day. It’s September and almost every day I remind myself I have to get into a routine but I procrastinate and leave it for another day. An excuse always arises which makes me skip my daily run. Some of the excuses in my head can be that my daughter did not take a nap (no excuse because Lucy takes care of her most of the time), or I did not drink enough water for a long run, I have a deadline on a project, I have to write/edit a blog post or three, and the list of excuses can run longer than what I could physically run. Looking at these excuses helps me realize that the real reason I don’t go running is because I make up too many excuses. In the meantime while I keep thinking of getting back into running, I have been doing quarter to half-mile runs. I also combine them with some sprints when I take Juanga out for walks. JuanGa, my black Labrador, was used to having a backyard where he could run and play all day. Now being in the apartment, which he seems to enjoy because of the cool ocean breeze and movement of people (he loves to people watch), he does not do much running unless I take him out. These short runs are a lot more exercise than what I usually get and are probably about the same amount of running that Juanga use to do at the other house. I know Juanga needs the exercise and I am not prepared to release him off leash; a major reason for this is the many unbalanced dogs that roam the beach. This way I get the benefit of the exercise while I do something fun with Juanga. I recently went back to the gym. This is another step on the road towards getting myself into a better shape. So far with a minimum of 3 walks a day plus some running, I have lost some weight and I might need a project soon to be able to upgrade to jeans that can fit me. With only subtle changes, I am seeing results than were not expected. This makes me feel better and also helps me fit into some clothes I had not used. As I change one small thing at a time seeking better quality of life, I can see how it accumulates into greater things long term. Maybe going for a 1-mile walk with your family and/or pets? Go for it!